Want to put your DVDs on iPad, iPhone, iPhone 5, HTC, Android Phone, and lots of other portable players ? Rip encrypted DVDs to preset media formats to play virtually anywhere. 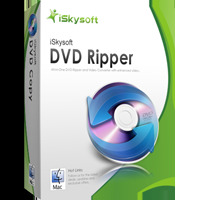 iSkysoft Mac DVD Ripper is a professional Mac DVD ripper application that can rip encrypted commercial DVDs as well as homemade DVD-R to all sorts of video files and extract DVD audio to various audio files of your choice. This DVD Ripper for Mac users can rip encrypted DVD to video formats including MP4, WMV, AVI, MOV, M4V, 3GP, MPG, MPEG, FLV, VOB and HD video, and it can convert DVD audio to MP3, WMA, M4A, AAC, AC3 etc. With this powerful Mac DVD ripping software, you can output video and audio files that can be perfectly played on most portable players such as iPad, iPhone 5, Android, Apple TV, PSP, Xbox 360, PS3, iRiver, Creative Zen, Archos, PMP, Smart Phone, Pocket PC, PDA, HTC phone, MP4 Player, and other video and audio players. iSkysoft DVD Ripper for Mac lets you select DVD subtitle and audio track to convert your DVD movie with any available language, along with setting video brightness, contrast, saturation and so on. It also allows you to choose any chapters or titles to convert and trim the length of each title or chapter. iSkysoft DVD Ripper for Mac even allows you to convert the selected DVD contents into one file if you don’t want to generate a file for each chapter or title. Click here for PowerPC version. At least 512 MB physical RAM. The step-by-step tutorial will show you how to Rip encrypted DVD to Any Video or Audio Format of your choice on Mac OS X with iSkysoft DVD Ripper for Mac ! 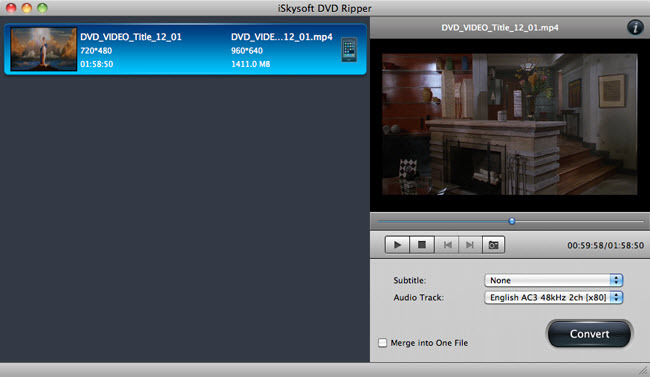 Launch DVD Ripper for Mac and Add Your encrypted DVD Movie. Choose a Video or Audio Output Format. Click the "Convert" button to start DVD ripping on Mac. A professional program developed for Mac Intel (include Mac OS X 10.8) users. Strip CSS protection and some encrypted DVDs and rip them to plain videos. A powerful DVD Mac ripping software program to rip encrypted DVD to regular video files or HD video such as MP4, WMV, AVI, MKV, MOV, M4V, 3GP, MPG, MPEG, FLV etc. After conversion, the converted DVD movies can automatically show up in iTunes, ready to sync. Rip encrypted DVD audio to MP3, WMA, M4A, AAC, AC3, and ASF etc for Mac users. Rip DVD to play on latest iPad 3, MS Suface, iPhone 5, Apple TV, PSP, Xbox 360, PS3, iRiver, Creative Zen, Archos, PMP, Smart Phone, Pocket PC, PDA, cell phone, MP4 Player, MP3 player, and many other video and audio players. DVD main feature extraction allows to rip DVD movie without DVD menu and it just starts playing right away. Allows you to merge and convert selected titles or chapters into one file. Supported multiple CPUs for multi-thread batch conversion, greatly improve conversion speed. It is a very easy to use Mac DVD ripper. With its intuitive and easy interface, you can rip encrypted DVD on Mac OS X with just a few simple steps. is a developed dvd to MP4 for Mac OS X users to convert DVD to MP4 video files. is professional to convert encrypted DVD to 3GP to play on video cell phones. is Advanced audio encoding settings, can Rip DVD audio to MP3 and other audio formats. is a professional Apple TV converter for Mac OS X..
is iPhone conversion program to convert DVD to iPhone video and convert DVD audio to iPhone audio on Mac Intel and Power PC. is a specially designed for Mac Intel and Power PC, convert encrypted DVD to iPod touch, iPod classic. is powerful, all-in-one DVD Ripper software which combines the features of DVD Ripper and DVD Audio Ripper. converts DVD's to play on almost any portable device.